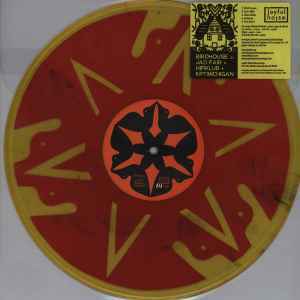 Limited to 300 hand-numbered copies, with the first 45 featuring black ink on single-sided translucent gold vinyl (see other entry), remaining 255 on single-sided translucent yellow vinyl screen-printed with red ink (this entry). Buyer pays shipping. Due to the rising costs of USPS First Class Mail in the states, and the desire to keep shipping as economical as possible, all orders now ship via Media Mail. If you prefer an alternative method for transit, just lemme know. Media Mail LP shipments to US destinations begin at $5.00 per shipment; First Class International Package for one LP to Canada starts at $18 and First Class International Package for one LP overseas typically starts at $25.00 per shipment for LP's. One CD costs $3.50 for Media Mail in the states; $11 to Canada and $15 overseas. 8.75% sales tax is charged on all shipments to California. Graypunk Records takes great care in ensuring that your record(s) arrive in the same condition in which they left. We do not take any shortcuts or reuse previous shipping boxes. Oh, and we do not use old, outdated 12'x12" LP mailers, but rather use vinyl specific mailers - generally either Bags Unlimited's Mighty Mailers or Whiplash Mailers - for all 12" shipments. Thank you!